A job seeker fills in application forms during a job fair at Shanghai Stadium February 4, 2012. China’s unemployment rate has hit its lowest point in multiple years at 3.95 percent by the end of September, but employment still face challenges as the economy pushes ahead with structural reforms, China’s labor ministry said on Sunday. The ministry of human resources and social security said in a statement that 10.97 million new jobs had been created in China from January to September this year, a growth of 300,000 compared with the previous year. The figure represents having essentially fulfilled the ministry’s year-end target, the ministry said in a pre-prepared statement given to reporters. “We need to create 15 million jobs per year,” Yin said, singling out China’s more than 8 million new university graduates that enter the job market each year as one group in need of additional employment. Yin also said the low unemployment rate in the face of an overall slowdown in the economy was largely due to the new internet economy and entrepreneurship, adding that the ministry would actively support startups to help them “thrive”. From 2015 to 2020 every one percent increase in GDP is expected to equal roughly 1.8 million new jobs, Yin said. Premier Li Keqiang said in March that China added 13.14 million new urban jobs in 2016 and aims to add another 11 million this year while keeping the registered unemployment rate below 4.5 percent. The labor ministry’s announcement was made as part of a once-ever-five-years congress of the ruling Communist Party, which opened last Wednesday and runs until Tuesday. At the congress, the Party sets broad policy directions and reshuffles top leaders. As China’s economy slows, Beijing has made increasing efforts to stave off mass unemployment that may spark social unrest. China’s official unemployment rate has remained generally stable as economic growth has dipped to a 26-year low and the government forges ahead with ambitious plans to cut back on industrial capacity. 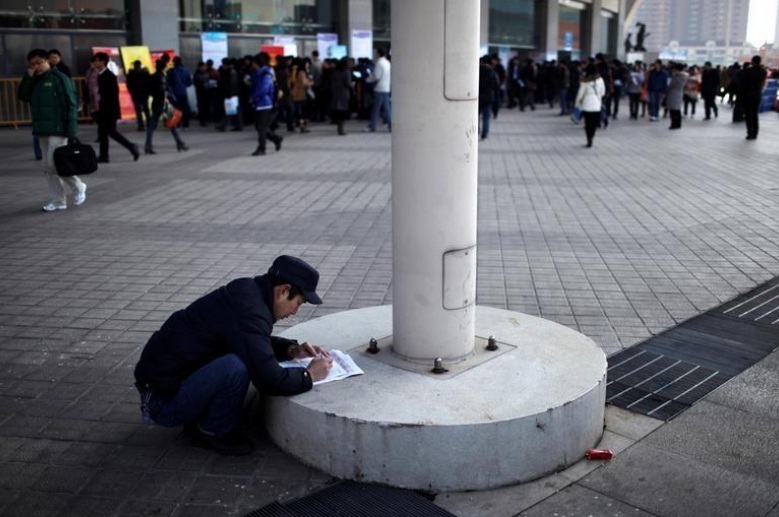 Many analysts say, however, that the government figure is an unreliable indicator of national employment conditions as it measures only employment in urban areas and also doesn’t take into account the millions of migrant workers that form the bedrock of China’s labor force. On an annual basis, the official unemployment rate was last below 4 percent in 2001, when it was 3.6 percent, according to data from the National Bureau of Statistics. The rate ended 2016 at 4.02 percent after not budging from 4.1 percent from 2010-2015. The government has said that some sectors, especially those targeted by capacity cuts, such as coal and steel, still show signs of unresolved employment challenges. The ministry of human resources in April said that China would need to resettle about half a million workers that lose jobs in the coal and steel sectors this year and will speed up development of a “black list” system for firms with wage arrears.